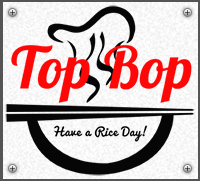 Online ordering menu for TOP BOP South. Welcome to Top Bop South! We have delicious Asian cuisines at a great price! Come try our beef bop, dynamite bop, or shrimp tempura. We are located on the corner of Old Seward HWY and Scooter Avenue not too far from Campbell Creek Estuary Park! View our menu and order online today.